This post is sponsored by Red Baron but the content and opinions expressed here are my own. Dinners on Halloween Night can be tricky. Treat your family Halloween Night with a variety of flavors offered by Red Baron. If there’s one thing that our house can agree on, it is delicious pizza. It never fails, every year on Halloween, things get crazy. Costumes don’t seem to fit right, everyone needs help getting ready, and everyone is hungry. Put the dinnertime madness to an end by planning your Halloween dinner with a tasty Red Baron® Pizza. Everyone gets fed, everyone is happy, and your night just got easier! Red Baron® Classic pizza has 11 different varieties to satisfy your taste buds. From cheese to more adventurous flavors such as Chipotle Chicken- there’s something for everyone. Red Baron® also offers Brick Oven Pizza varieties such as Pepperoni, Cheese Trio, Meat Trio, and Sausage Supreme. Head over to Red Baron’s website to find where you can pick up your favorite pizza flavor. Whether it’s Red Baron® Classic or Brick Oven Crust, it’s sure to calm mealtime. Why hassle with making time consuming dinner when there’s homework to do, mummies to wrap and princesses to crown. I surely don’t want to add to my Halloween evening chaos by making a meal that not everyone wants to eat when I can choose Red Baron® pizza. It tastes good, has robust flavors, and it’s something we can all agree on. What comes after making and eating dinner? Dishes. It’s never a task that I look forward to after dinner… and especially not on a busy night such as Halloween. I like the idea of picking up a Red Baron® Brick Oven Pepperoni Pizza at my local grocery store, putting it in the oven, and feeding my entire family hands free. On Red Baron® pizza nights I can feed the kids before my little angels turn into little goblins. 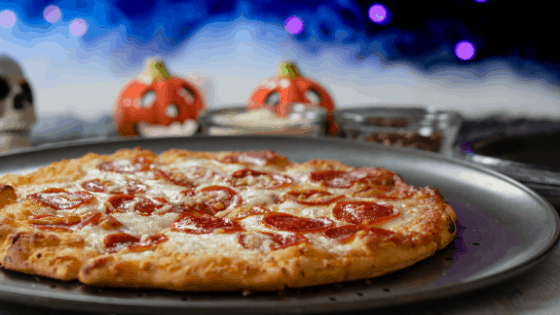 Make it a tasty and easy Halloween night with Red Baron® pizza. Start it off by eating a delicious pizza to get your family’s bellies full and ready for some fun trick-or-treating.